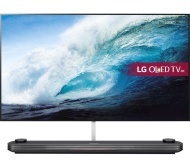 alaTest has collected and analyzed 47 reviews of LG OLED65W7 Series. The average rating for this product is 4.7/5, compared to an average rating of 4.6/5 for other products in the same category for all reviews. We analyzed user and expert ratings, product age and more factors. Compared to other products in the same category the LG OLED65W7 Series is awarded an overall alaScore™ of 94/100 = Excellent quality. LG's Signature OLEDW7P series of TVs let you hang a thin, bezel-free OLED right on your wall and pair it with a Dolby Atmos-capable soundbar for a striking entertainment experience with superlative picture quality. Top-notch OLED picture with wide color gamut. Frame-less panel design is seriously eye-catching. Soundbar electronics enclosure with height channels for Dolby Atmos. Two remotes. Prohibitively expensive. Two-piece design means wall-mounting is required. I flew 3000 miles to test LG's new OLED—here's what happened. We preview LG's new flagship W7 Wallpaper Ultra HD 4K OLED TV with HDR 10, Dolby Vision, Dolby Atmos and WebOS 3.5. It's called a wallpaper TV and it truly is! Breathtaking images. I had a plasma TV and kept it for many years because LCD/LED TV's were no where near as good. But OLED has changed all that now. It's quite tricky to hang on the wall! 2.57mm screen. Blacks and colours are amazing. Great set for gaming. AIO box sounds average at best. With a brilliant design comes a similarly high price.